Air Fryer vs Convection Oven - Which one is more suitable for you? Many people discuss about the differences of air fryers versus convection ovens. While both are similar in the cooking process, there are some subtle differences between the two. Both products can cook food much more quickly than in a conventional oven, and add a significant deal of convenience. Although these two products have some aspects in common, there are differences that could make one more beneficial than the other, depending upon your needs and desires. Both products also have pros and cons so it will be up to you to determine which one better suits your cooking needs. To find out which one is more suitable for you, you need to understand how each product cooks food; the time required to cook; quality of the food produced; how easily they are cleaned; and price and durability of each. A convection oven is a common kitchen cooking appliance that cooks food by rapidly circulating hot air. It is similar to a broiler but uses fans to distribute the heat evenly and cook more quickly. First developed in 1945, the first convection ovens generated heat in a similar fashion as conventional ovens. Modern convection ovens normally generate infrared radiation heat through electrical coils located at the bottom of the oven. The fans then circulate this heat around foods to cook them quickly and evenly. Related: How Does a Convection Oven Work? The name “air fryer” can be misleading, as it can conjure thoughts of traditional oil-frying methods. However, air fryers use much less oil to cook foods and generally provide a healthier method of cooking than traditional fryers. Air fryers are very similar to convection ovens in how they create and distribute the heat to cook food. They are often viewed as countertop convection ovens, but function differently. Cooking in an air fryer consists of placing food into a metal basket inside the fryer itself. Then a stainless steel heating coil above the basket generates heat. As the coil heats up, fans above the basket rapidly push air down through the basket. This hot air is then spread evenly around the food and creates a fast method of broiling. This is known as rapid air technology or rapid air circulation. If you want to have an oven that use both convectional heating and air frying, you can go check out our NuWave Oven Reviews. The NuWave Oven uses three different systems simultaneously: infrared, conduction, and convection. Related: How does an air fryer work? Convection ovens are square in shape and looks very much like a smaller version of a traditional oven. They are similar in size to most consumer microwave ovens and can fit in the same spaces. These appliances normally range from about 12 inches to 16 inches in length with the depth and height of a common microwave oven. The size and shape of an air fryer is one of the things that sets it apart. It is shaped very differently than a convection oven and looks more similar to a consumer deep fryer. They are smaller in size– about the size of a large coffee maker and with similar looks– and thus can fit less food than convection ovens. However, they are easily adaptable to any size and can fit on any countertop. Convection ovens are able to cook much more quickly than traditional ovens, which is what made them popular. Cooking time will differ depending upon the food, but it is similar to a broiler that heats evenly. This is another aspect that sets air fryers apart. With the rapid air circulation technology, they can cook approximately 50 percent faster than convection ovens. Given the fast cooking, many air fryers come with a thirty-minute timer. However, you can still find ones that allow you to cook up to 60 minutes. Check out air fryer reviews to for a comparison table. This is largely a matter of opinion. Both are able to cook most foods more quickly than other traditional methods. Air fryers can fry, bake, grill and roast whereas convection ovens can bake, roast, toast and reheat. Food quality from each appliance depends on the type of food you want to cook. Air fryers normally dry foods out more and offer more crispness, while convection ovens are better for keeping foods juicy. Related: What can you cook in an air fryer? 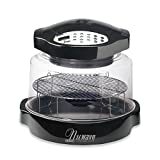 This will depend upon usage and foods cooked, but air fryers are normally much easier to clean because most air fryers have dishwasher safe parts. Learn more about How to Clean an Air Fryer? Air fryers are usually a bit more expensive than convection ovens. The prices of air fryers start from $70 whereas those of convection ovens start from $40. However, the prices of both can be higher than $200 if they have high technologies and preset functions. For example, Philips HD9230 Digital AirFryer, one of the best air fryers in the market, costs more than $200 because it has patented Rapid Air Technology, the design that facilitates air circulation and digital control system. Breville BOV800XL Smart Oven which is one of the best convection ovens costs around $200 because of its preset functions and ability to adjust heat distribution to ensure the result. Durability will depend upon the frequency of use and the amount of care involved, but convection ovens are generally more durable. If used and cleaned properly, both products can last several years. Which appliance you should go for depends on your cooking needs. If you love fried foods and want to cook them with less oils, you should go for an air fryer. Otherwise, a convection oven is more suitable for you.